The music video for K-pop boy band EXO’s song “Tempo” hit the threshold of 100 million YouTube views on Monday, adding to the collection of the band’s songs that have achieved that feat, SM Entertainment said. “Tempo” is the main track off EXO’s fifth full-length album, “Don’t Mess Up My Tempo,” released on Nov. 2, which topped the iTunes album charts in 48 countries and regions upon its release. It also ranked as high as 23rd on the main Billboard 200 album chart. 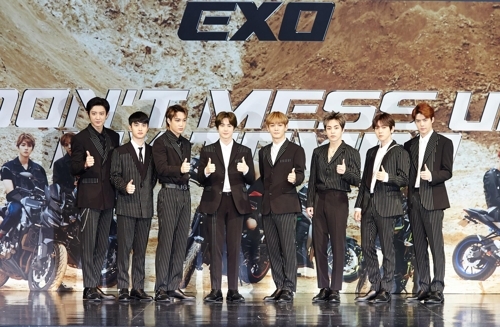 “Don’t Mess Up My Tempo” sold more than 1 million copies, making EXO the first artists to achieve accumulated album sales of over 10 million among singers who debuted after 2000. “Tempo” is the ninth music video from EXO that has garnered more than 100 million views. Three of them — “Monster,” “Call Me Baby” and “Ko Ko Bop” — have surpassed the 200 million mark.